What better way to spring into the season than chasing migrants across Western North Carolina? I was with the Franklin Bird Club at Kituwah on April 27 and we had beautiful weather and good birding. I had teased that trip by noting that Kituwah is one of the most reliable places I know of for finding bobolinks in migration. 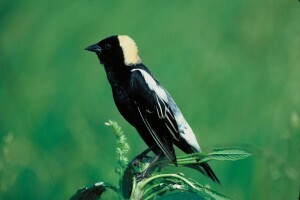 Well, you guessed it, after tromping all the fields we wound up bobolink-less. But the pain was eased by killer looks at orchard orioles and a group of female and immature blue grosbeaks plus outstanding views of normally – hard to see – white-eyed vireos. These skulkers, though quite vociferous, hardly ever come out of the dense brambles. However, on that morning, they danced and flitted about on the edges of their brushy homes giving great looks. We were having a great morning for sparrows, by the time we got around to a spot along the railroad tracks, where white-crowned sparrows had been all winter, we already had six species – song, field, savannah, swamp, chipping and white-throated. The white-crowneds did not disappoint, they were in beautiful breeding plumage and we got a bit of lagniappe at that spot. A tail-bobbing palm warbler was foraging along side the tracks and a two by three-foot puddle of water had the rapt attention of a northern waterthrush. Now, fast-forward a week. I caught up with George Ellison and friends on their annual Great Smoky Mountains Birding Expedition (GSMBE) during their lunch break at Collins Creek picnic area in the Great Smoky Mountains National Park. I missed the morning tour around Bryson City because I was at work – birding. After a two-year hiatus, I am once again contracted with the Forest Service (FS,) doing bird point surveys across the region. It’s a highly enjoyable, yet quite intensive gig, with 213 points to survey between May 1 and June 15, from Hiwassee Dam to the Overmountain shelter along the Appalachian Trail near Roaring Creek and from Roan Mountain to Brevard; every available morning is spent in the field, darn it. After birding along the Blue Ridge Parkway, the GSMBE hit the fields (Kituwah) where we always finish Saturday afternoon. Orchard orioles and blue grosbeaks were again showing off and Monday’s absent bobolinks were present and accounted for. With the day waning and the group looking forward to social hour, I urged them on to the railroad tracks where the northern waterthrush and palm warbler (two species lacking on our list) had been on Monday. Well the puddle was bone dry and the waterthrush and palm warbler had seemingly evaporated as well – ah, the vagaries of migration. On Friday, May 8, I joined four guests at Cataloochee Ranch, for a short birding hike on the property. We had a nice walk around up top and got great looks at chestnut-sided warbler, black-throated blue warbler, northern parula, eastern bluebird, blue-headed vireo, veery and more. This was part of a “birding weekend” program that is in the planning stages at Cataloochee. I see lots of potential for a great annual event at the Ranch. One of the coolest aspects of birding is that something totally unexpected can occur at any moment. Last Saturday (5/9) I had finished my last FS point of the morning at a beautiful spot – at the end of FS Road 351-A – in the Tusquitee District in Clay County, when some movement caught my eye. I got my binoculars on a small bird foraging in some bushes. It was backlit but I could see a yellowish-green spot on a gray back – diagnostic of northern parula. But then the bird turned its head and, whoa – black markings across the face and a long, heavy yellow-throated-warbler-looking bill – what in the world? I opened my Peterson’s field guide to the page that had northern parula and yellow-throated warblers on it to look at the markings to see if I was missing something and bingo! – there was a drawing of Sutton’s warbler – a rare yellow-throated X northern parula hybrid – that’s what I love about birding!